The human brain is a pretty fantastic piece of equipment. It does so much stuff that it uses around 20% of your calorie intake every day even though it accounts for only 2% of your body weight, and it’s much more powerful than the most advanced computers we can dream up. The pictures below highlight some research about how your brain responds to different kinds of food, how this is relevant to weight, and how external factors like stress can make it more or less tempting to eat junk food. They’re kind of beautiful in their own way, and they might also help you stay on track when you’re facing something that won’t benefit your health in the long run. Instead of focusing on how you feel and trying to fight down your own desires, try thinking in the abstract about all these different parts of your brain lighting up. It might help you get past feelings of shame or judgement (it never helps to shame or judge yourself about food), and think more calmly about your decision. Sometimes, getting distance from the immediate “I want this/I shouldn’t” tug of war is really helpful, and the visual might just help you do that. Fructose makes you want more food. This study compared two types of carbohydrates, fructose and glucose. Fructose is what we typically call “sugar.” The carbohydrates in most fruit are mostly fructose; in most starchy vegetables (like potatoes), they’re mostly glucose. Table sugar, honey, and most other sweeteners are about half fructose, half glucose. Or in plain English, you’re not imagining it: sugar really could be making you hungrier in the long run. Stress makes you want more food. This study found that when they stressed people out, food gave them less pleasure, so they needed to eat more to get the same amount of enjoyment from their meal. 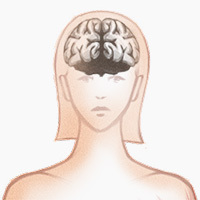 The picture shows that in the “rest” (unstressed) condition, subjects had higher activation in three areas of the brain: the orbitofrontal cortex, frontal cortex, and putamen. All of these are areas help give you the signal that you’re getting the thing that you wanted. If they’re less activated, it means that you need more food to get that “OK, we’re good” signal from your brain. This effect held true whether the subjects were hungry or not. Physical hunger had nothing to do with it. This study was done on thin women, showing that stress-eating isn’t just something that happens in fat people. The stress was moderate; this was not an extreme event. If you’ve ever gotten really stressed and just kept getting that itchy, need-to-eat feeling even though you weren’t hungry, this might be why. Your brain responds differently to foods you think will make you fat. The results suggest that “photographs of fattening foods stimulate brain areas critical to our subjective experience of appetite…these areas were not activated by images of non-fattening foods.” In other words, if you get hungry just looking at pictures of junk food, if it has an almost magnetic draw for you – that’s not an accident. The big picture: people with obesity have measurably different brain responses to food than people at a normal weight. There’s some evidence from long-term studies that this is actually causative (in other words, it’s the brain differences that cause people to gain weight, not the weight gain that causes brain differences). But there’s also some evidence that it’s modifiable. People with obesity feel hunger more and fullness less. This study found that people with obesity are more sensitive to feeling hungry and less sensitive to feeling full than people at a normal weight. 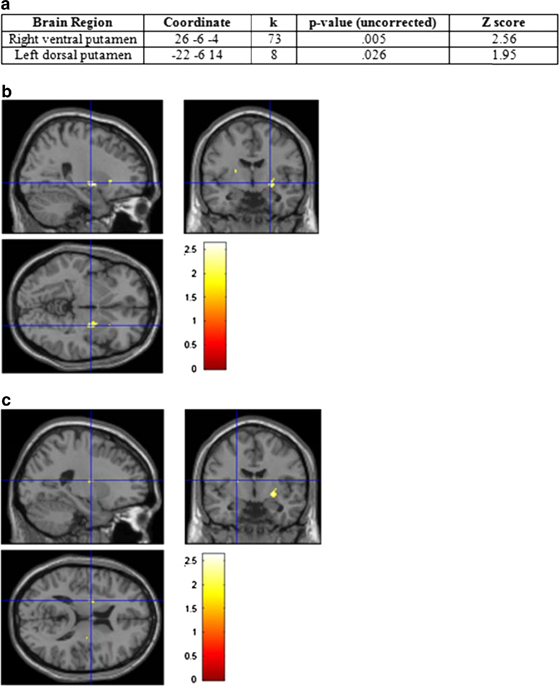 The top picture shows that overweight people have more activation in the anterior cingulate cortex when they’re fasting. According to the study, this suggests a greater “wanting” for food. 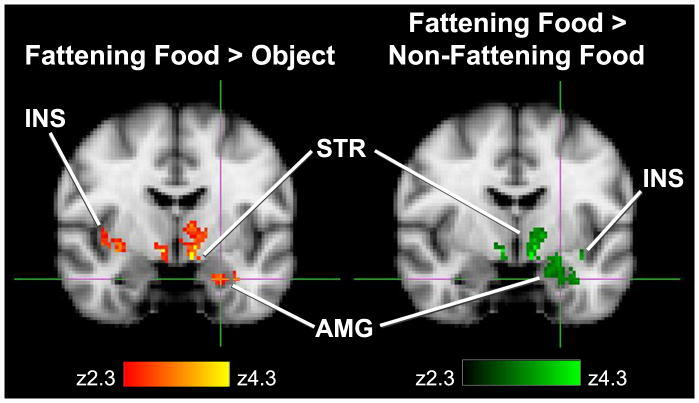 The bottom picture shows that overweight people have less activation in the prefrontal cortex after eating. This suggests that the signal to “stop eating now” is weaker in overweight people after eating. People with obesity want more food even in the absence of hunger. In this study, researchers looked at obese people and normal-weight people. All the subjects saw pictures of high-calorie foods, low-calorie foods, food-related things (like utensils) and non-food-related things. 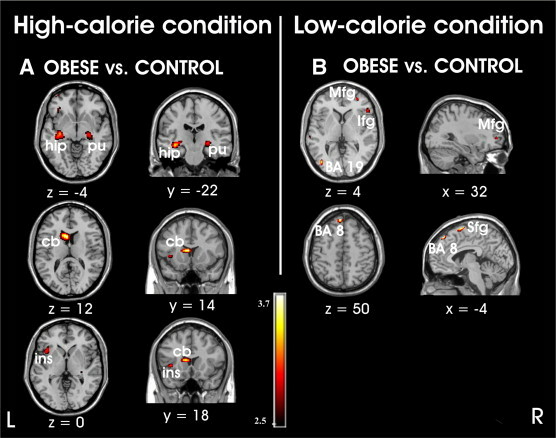 This picture shows areas of the brain with greater activation in obese people when they looked at high-calorie (on the left) and low-calorie (on the right) foods. The parts of the brain that were activated more in the obese women include areas involved in habit learning, motivation, taste processing, emotions, and memory. 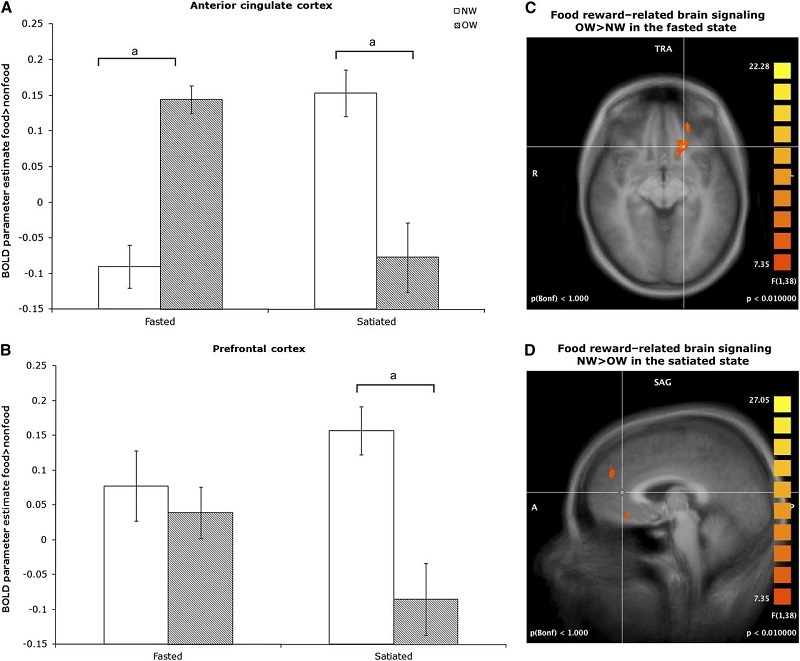 And here’s the really interesting part: in the obese people, the dorsal striatum (part of the brain responsible for the “go get something to eat now” signal) was lit up even when they weren’t hungry. The authors took this as evidence in support of food addiction. Obesity-related food responses may be changeable. This study was the first to show that the differences above could be modifiable. It was very small (only 13 subjects) and the researchers were very insistent that this line of research needs more studies, but it’s still interesting. After going on a diet, the subjects had a stronger food reward response to the diet-friendly foods than they had initially. This indicates that it might be possible to train your brain to like different kinds of food. It’s not clear whether this was caused by the weight loss, or by the new habits and behaviors that caused the weight loss. The picture shows the areas of the brain where the changes took place: the right ventral putamen and the left dorsal putamen. After the diet, subjects had a higher response to diet-friendly foods in the right ventral putamen (top three pictures), and a lower response in the left dorsal putamen (bottom three pictures). …and a reason to hope that it gets easier.